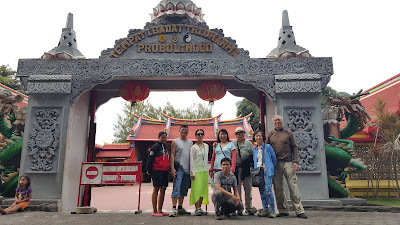 Probolinggo City tour from Probolinggo Cruise Ship Port is the short tour package for 1 day duration mostly requested by the Cruise Ship passangers. the trip will start in the moring around 06.00 – 08.00 AM, then finish at afternoon around 04.00 – 05.00 PM. When You arrive at the Cruise Ship Port or Tanjung Tembaga Probolinggo Harbour, Our partners will pick You up using private Air Conditioned transportation to explore various interesting places around Probolinggo City. We provided the Probolinggo City tour package including historical site consist of the places of worship such as Curch, Mosque, Budhism Shrine, Museum of Probolinggo City Hero, cultural activity, traditional market, shopping centre or batik centre. If You have more time, Our partner will recognize You about the local farmers activity, home traditional industry, students learning place, and typical food. Afterward, return to Probolinggo Cruise Ship port City and Finish the City tour. Visiting shopping centre and batik centre. We will get experience how to make batik by ourselves. And of course, if you like the batik, you can buy it. Then visit traditional market and ceramic factory. If You have more chance, Our partner will accompany your trip to the Probolinggo village, and directly witnessing the activity of local farmers cultivating their rice field, home industry activities while learning about the local people language, dont forget to take photo together with them. In order You can get an impressed memories. Back to Probolinggo port and finish Probolinggo City tour. For detail information about Probolinggo City Tour from Probolinggo Cruise Ship Port, and tour package price You can visit Our Contact.